I'm not one to follow New Year's food traditions. I don't do cabbage or black-eyed peas. In fact, this year I made a dish that is supposedly bad luck: chicken. 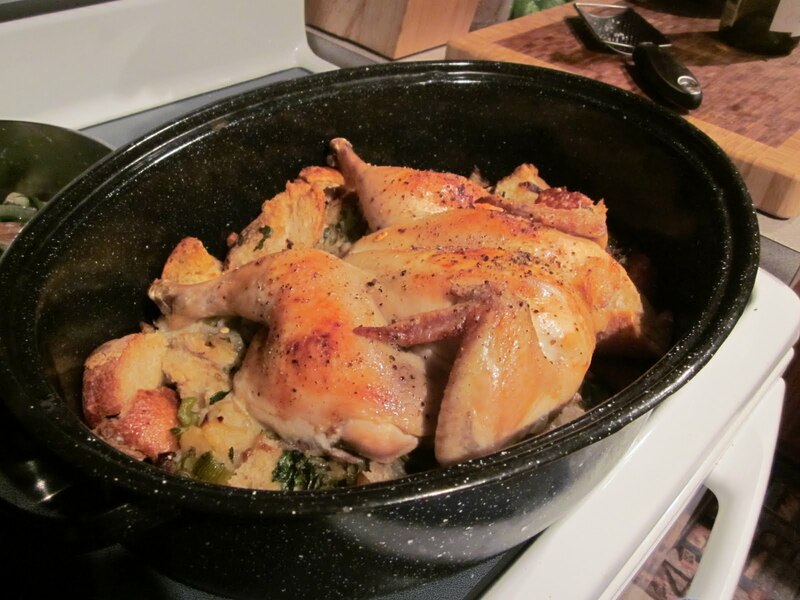 Of course, I'm not superstitious so I had not qualms about making a delicious roast chicken for dinner. I did, however, add some kale to my green bean side dish, so maybe that will help counteract the bad luck of the chicken I made. 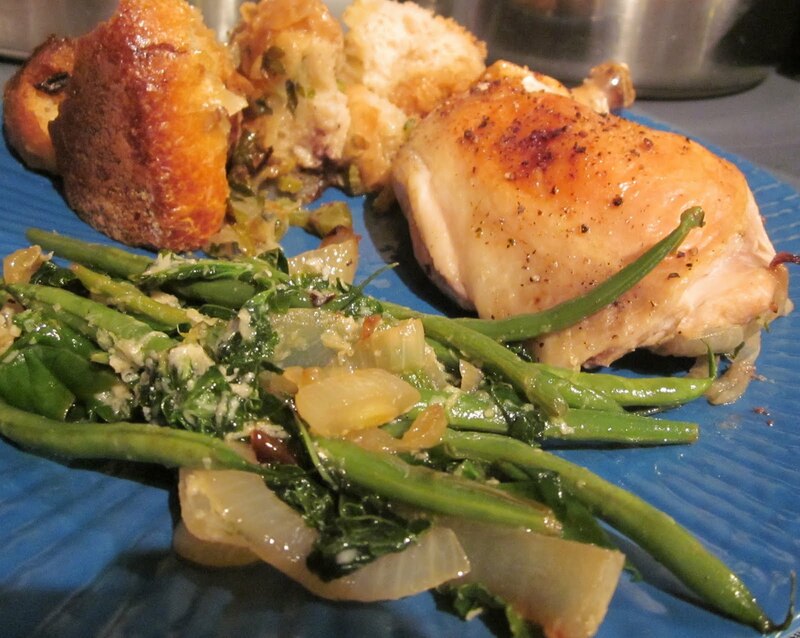 For my main course, I took a recipe from Zingerman's Guide to Good Eating called Lex's Roast Chicken. It is by far the best roast chicken I have ever made. 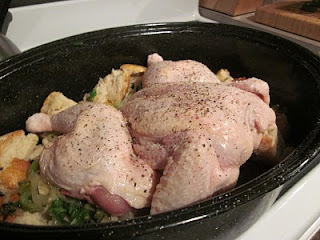 Rather than roasting the chicken whole, this recipe instructs you to cut out the backbone and roast it flat. Not only does this brown the chicken evenly, but it surprisingly keeps it juicy. 2. In a large skillet, heat 1/4 C olive oil over medium heat. Add the onions and celery and saute for 10 minutes, stirring occasionally. Add garlic, lemon zest, thyme, red pepper flakes, 1 & 3/4 tsp salt, and 1/2 tsp black pepper. Saute until onions and celery are soft and translucent, 5-7 minutes more. Remove from heat, stir in parsley and set aside. 3. While the onions and celery are cooking, butterfly the chicken by removing the backbone, which is on the opposite side of the breast. Use kitchen scissors to cut along both sides until it is completely removed. 4. Lightly oil a roasting pan. Arrange the bread slices to cover the entire bottom of the baking dish. 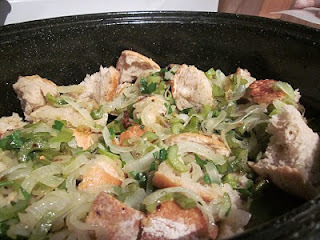 Layer onion and celery mixture over the bread in the roasting pan. 5. Place chicken skin side up on top of the onion-celery mixture. 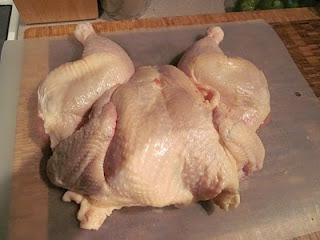 Rub the chicken inside and outside with remaining 2 T olive oil, the remaining 1 tsp black pepper, and remaining 1/2 tsp. salt. Pour lemon juice over chicken. 6. Roast for 1 hour 30 minutes or until a meat thermometer inserted into the thigh registers 160 F (start checking at 1 hour 15 minutes to avoid overcooking). The skin should be golden brown and the bread should have absorbed all of the chicken's juices. (I found that I needed to add a few splashes of store-bought chicken broth to avoid drying out the bread cubes that weren't covered by the chicken). 7. Remove from oven and let stand for 10 minutes. Transfer to cutting board and cut chicken into quarters. Spoon some of the bread and onion mixture onto each plate, place a chicken quarter on top or next to stuffing and serve. I plated this with Giada de Laurentiis's Spicy Parmesan Green Beans and Kale and to me, it was the perfect dinner to celebrate the New Year! I like the sound of your good luck dish. I've never heard of cutting the chicken so it lies flat but I'm going to give it a try as I love juicy chicken. Thanks for sharing the recipe. Great way to make a chicken. 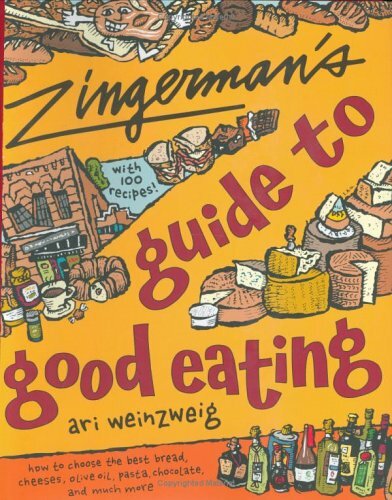 I love Zingerman's! I grew up in Ohio about 45 minutes from Ann Arbor. They have the best rye bread. That chicken looks delicious - and I hadn't ever heard it's suppose to be bad luck! That looks great! I'm so glad you actually tried a recipe. I think I'm going to buy the book when the library demands the copy I have back.